It's 2315. Human society depends on an exotic energy source called rubium for all of its advanced technology. A small group of explorers have recently discovered an alien moon that is exceptionally rich in rubium. In desperate need of more funding for their research, they simultaneously sold the "exclusive" mineral rights to four competing corporations: Ares Inc., Black Helix Industries, The Galactic Syndicate, and Zyborg Technologies. By the time the corporations discovered the ruse, the explorers had moved on, leaving the corporations to contend with the liquifungus forests, the magma pools, and the indigenous alien life forms. Far out on the galactic frontier, away from oversight or public scrutiny, these four corporations now do fierce, bloody battle for control of the moon's rubium. 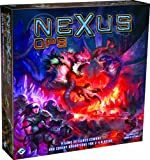 By taming and unleashing the rock striders, lava leapers, fungoids, crystallines, and the plasma-breathing rubium dragons, the corporations hope to eliminate their competitors and seize control of the precious rubium deposits for themselves. Once they have harvested all of the rubium and secured the mysterious alien monolith on the moon's surface., well, who knows what sinister agenda lurks at the heart of their corporate greed? 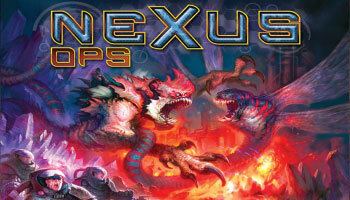 Nexus Ops is a light-medium science fiction war game. The game boasts a hexagonal board that is set up differently every time, as well as (in the Avalon Hill edition) cool "glow" miniatures and lots of combat. Players control competing futuristic corporations that battle each other for control of the moon's Rubium Ore. By winning battles and fulfilling Secret Missions, you can obtain victory points. 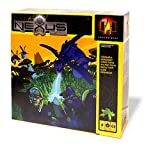 Units are composed of various alien races and have stats similar to those used in the Axis & Allies series. Combat is also similar. Players who lose battles are compensated with Energize cards which grant them special powers later. Players can also obtain Energize cards by controlling the Monolith, a raised structure in the center of the grid. The first person to reach the required number of victory points wins the game. In Nexus Ops, two to four players control factions of corporate troops and indigenous life forms on an alien moon. Players deploy troops from their home bases as they explore the moon, mine resources, purchase troops, win battles, and fulfill missions to win the game. The object of the game is to earn 12 or more victory points by completing secret missions and winning battles.